Hubbell-Wiring 16 Series 1-Pole Female plug in black color, has current rating of 400-Amps and voltage rating of 600-Volt AC/250-Volt DC. 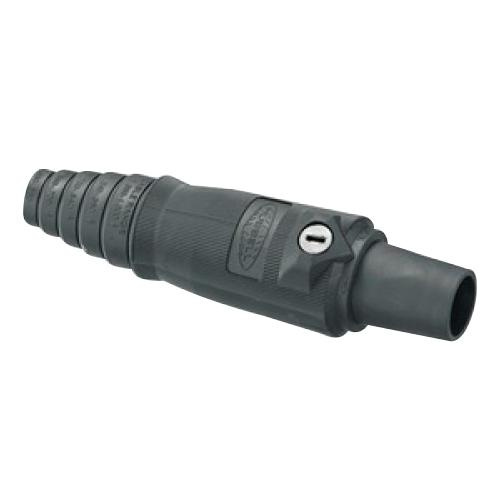 This plug accommodates wire of size 2/0 - 4/0-AWG. It features thermoplastic elastomer construction. This plug is NEMA 3R/4X/12 rated. It measures 1.06-Inch Dia x 6.84-Inch. This plug is suitable for entertainment, theme park, carnival equipment, concerts and movie making application. Plug is UL/cUL listed.